Would you believe that the platypus has no stomach? It does seem quite odd that any animal lacks the organ that breaks down the food that we consume so it can be more easily digested, but the platypus is a rather odd creature anyway. With its duck bill, beaver tail, otter feet, and the ability to inject venom into its attackers. It is so weird that when it was discovered people didn’t believe that it was a real animal, and that someone had just sewn pieces of other animals together. To compound its peculiarity, along with the echidna, it is a monotreme, meaning that they are egg laying mammals. Now that is weird. But now we know that much of its biological makeup can be adequately explained by the way that it lives, so why is it that the platypus has no stomach? 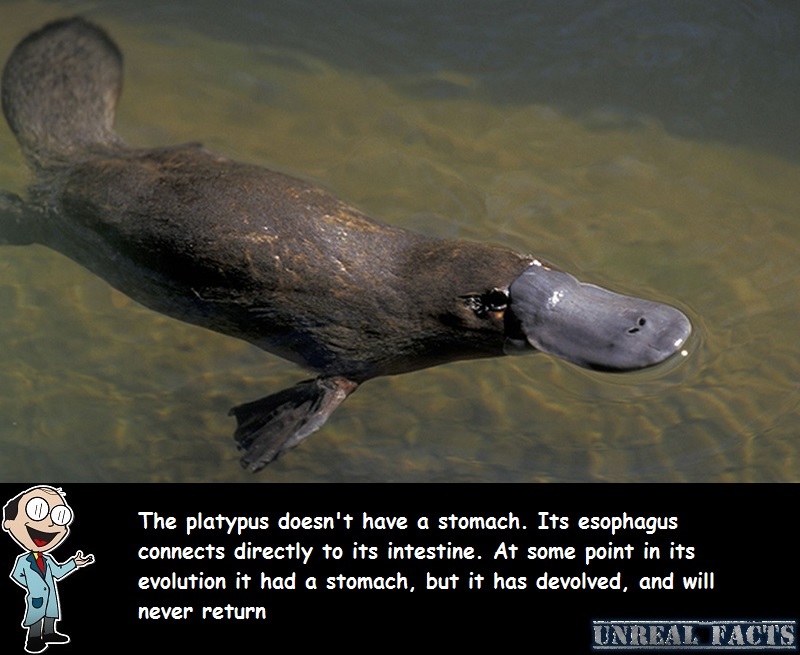 It seems as though the stomach has devolved from the platypus, and it’s all thanks to genetics. When scientists were trying to explain why platypuses don’t have stomachs, they compared the DNA from a platypus to other animals. Lets just say that they discovered something fascinating. It appeared that certain protein cutting enzymes called proteases were missing in the gene pool. These proteins are only made in the stomach. Now that doesn’t sound all the odd, does it. No stomach, so obviously no protein, right? But a second, closer look revealed even more amazing discoveries. These proteins weren’t missing at all. They were just disabled. Like an inattentive student in class, they were there, but not really present. What does this mean for the stomach of the duck billed Aussie creature? It means that at some point in its evolutionary tree, it had a stomach. For some reason, and no one knows the reason why, it has disappeared, leaving the esophagus to connect directly to the intestines. While the evidence is there that they once had an acid filled bag in their bodies, the remaining evidence fails to explain why it is gone. Previous article The World’s Biggest Pimple on a Human, is It a Real Pimple?